P.A.W. 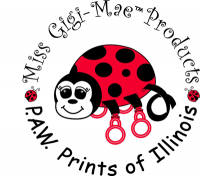 Prints of Illinois is a mommy-run business insprired by practical needs. Our products are proudly CPSIA compliant - and were so before the new guidelines were established. Because we are passionate about the safety and quality of every item we bring to market, Miss Gigi-Mae products have undergone extensive testing at three points during production on every product – at the beginning, middle, and end – to ensure only safe, quality materials are used consistently throughout the process.